HIGH The epic final boss fight. LOW Literally everything having to do with drilling through the earth. WTF Curious about the meaning of life? The game offers a pretty definitive answer. Following said pitch, this review could consist of just the word Sold!, as it does an incredible, unparalleled job of simulating the experience of wielding godlike superpowers. Well, it’s incredible right up until the last few levels when a new power is introduced and nearly impossible to use, stopping the game in its tracks. Fortunately, it wins back the audience with a truly spectacular finale. MR puts players in the role of the offspring of an all-powerful cube who lays out the plot. Apparently there are only two types of intelligent life in the entire universe — humans and alien monsters that fly around in preposterously huge silver ships. In a few months, there’s only going to one intelligent life form left, and the cube — who may also be God, it’s not super-clear — is putting a finger on the scale by imbuing its offspring with ridiculous superpowers to be used in defense of the earth. When it’s working, the gameplay is a delight. Using the PS4 controller, it’s a breeze for players to fly literally anywhere on the Earth in just a few moments with a remarkably intuitive control scheme. Pushing the left thumbstick flies the player towards or away from whatever they’re facing, and the right thumbstick handles large changes in orientation. There are also dedicated buttons for flying up and down, and these also act as speed controls. Essentially, the farther the player gets from the ground, the faster they’re able to fly. In just seconds they can go from hovering above a traffic jam to low-Earth orbit, then zip around to the other side of the world in a flash. It’s dramatic and it works perfectly. The combat is also largely well-designed and extremely playable. The player is primarily armed with energy bolts, a DBZ-style ultimate attack, and Superman-style eye beams. 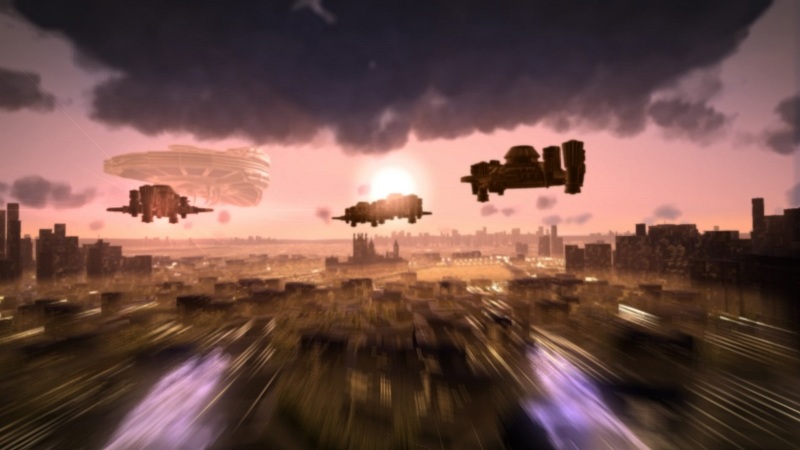 As aliens besiege Earth’s cities with a wide variety of demolition craft, it’s up to the player to destroy the ships with minimal loss of human life. This means they have to be extremely careful where they fire their energy blasts – a single shot can demolish a skyscraper, while a charged-up kamehameha will level an entire city if used improperly. There’s an impressive amount of variety to the alien craft. There are towers that mount buildings and crush them, mimics that pretend to be buildings, hoping to trick the player into doing their work for them, giant Thor hammers that level entire blocks, and huge metal worms that bore through everything in their path. Each one has a red crystal weak point strategically placed somewhere on their chassis, and the gameplay generally revolves around darting through the densely packed cities, trying to get a clear shot at the enemy before they cause too much damage. It’s thrilling. 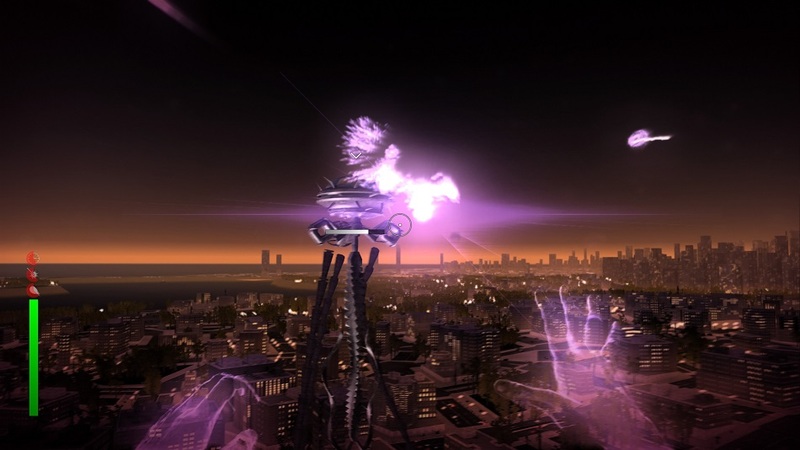 Megaton Rainfall works great for most of its nine missions, gradually introducing new powers and enemy types to crush. Then things get a little wonky with the introduction of the ‘dash’ power that allows the main character to fly forward so quickly that they drill straight through the ground. No matter how much I practiced, this power never worked quite right. It’s bad enough that players can only dig while looking straight down, ensuring neck kinks – the real problem is that it’s difficult to navigate while shooting through the Earth’s mantle. Enemies bury bombs (and themselves) in the ground, and players have very tight timelines in which to dig them out. Sadly, the awkward tunneling mechanic turns any attempt to do so into a chore. Disclosures: This game is developed and published by Pentadimensional Games. It is currently available on PSVR. This copy of the game was obtained via publisher and reviewed on the PSVR. Approximately 3 hours of play were devoted to the single-player mode, and the game was completed. There are no multiplayer modes. Parents: This gas was rated T by the ESRB, and contains Violence. The earth is in danger, and aliens must be destroyed in the most bloodless way possible. The only edgy things here are the way people in office buildings scream as said buildings collapse around them, and the way the subplots get into weird metaphysics possibly designed to blow the minds of impressionable teenagers. Deaf & Hard of Hearing Gamers: You should be good! All dialogue and instructions are offered as text, and there are markers onscreen letting you know when something dangerous is happening that you have to look at.